A new “smart headlight“ system invented by researchers at Carnegie Mellon University’s Robotics Institute can improve visibility when driving at night in a rainstorm or snowstorm. By constantly redirecting light to shine between particles of precipitation, the system prevents the distracting and sometimes dangerous glare that occurs when headlight beams are reflected by precipitation back toward the driver. “If you’re driving in a thunderstorm, the smart headlights will make it seem like it’s a drizzle,” said Srinivasa Narasimhan, associate professor of robotics. The system uses a camera to track the motion of raindrops and snowflakes and then applies a computer algorithm to predict where those particles will be just a few milliseconds later. The light projection system then adjusts to deactivate light beams that would otherwise illuminate the particles in their predicted positions. “A human eye will not be able to see that flicker of the headlights,” Narasimhan said. 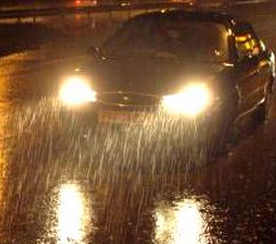 “And because the precipitation particles aren’t being illuminated, the driver won’t see the rain or snow either.” To people, rain can appear as elongated streaks that seem to fill the air. 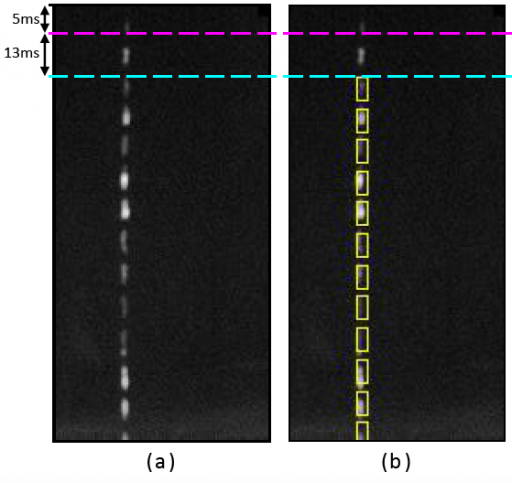 To high-speed cameras, however, rain consists of sparsely spaced, discrete drops. That leaves plenty of space between the drops where light can be effectively distributed if the system can respond rapidly, Narasimhan said. In their lab tests, Narasimhan and his research team demonstrated that their system could detect raindrops, predict their movement, and adjust a light projector accordingly in 13 milliseconds. At low speeds, such a system could eliminate 70 to 80 percent of visible rain during a heavy storm, while losing only 5 or 6 percent of the light from the headlamp. To operate at highway speeds and to work effectively in snow and hail, the system’s response will need to be reduced to just a few milliseconds, Narasimhan said. The lab tests have demonstrated the feasibility of the system, however, and the researchers are confident that the speed of the system can be boosted. The test apparatus, for instance, couples a camera with an off-the-shelf DLP projector. Roadworthy systems likely would be based on arrays of light-emitting diode (LED) light sources in which individual elements could be turned on or off, depending on the location of raindrops. New LED technology could make it possible to combine LED light sources with image sensors on a single chip, enabling high-speed operation at low cost. Narasimhan’s team is now engineering a more compact version of the smart headlight that in coming years could be installed in a car for road testing. Though a smart headlight system will never be able to eliminate all precipitation from the driver’s field of view, simply reducing the amount of reflection and distortion caused by precipitation can substantially improve visibility and reduce driver distraction. Another benefit is that the system also can detect oncoming cars and direct the headlight beams away from the eyes of those drivers, eliminating the need to shift from high to low beams. This research was sponsored by the Office of Naval Research, the National Science Foundation, the Samsung Advanced Institute of Technology and Intel Corp. The Robotics Institute is part of Carnegie Mellon’s School of Computer Science.